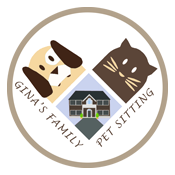 Thank you for your interest in Gina’s Family Pet Sitting. For your convenience, our office hours are from 9am to 9pm seven days per week. We will return your call, email, or form questions within a few hours if not immediately. We may be caring for a pet at that time. Any questions we can answer for you? Please use the form below. Ready to set up your account? Once complete, we will follow up with you during business hours.